fivesquaremeals - Hup, Nederlands, HUP! So the Oliebollen obviously worked, the Netherlands have made it to the Top Four in the World Cup! In Sydney last weekend, in a daze of post match watching sleeplessness, my family made a patriotic trip out to The Dutch Shop in Smithfield to stock up on snack foods and boost our supporter wardrobe with all things orange. and the back is a furniture store and temporary supporter heaven! We had a quick morning tea of hot chocolates and beef croquettes topped with mustard. "A croquette is a small fried food roll containing usually as main ingredients mashed potatoes, and/or minced meat (veal, beef, chicken, or turkey), shellfish, fish, vegetables, and soaked white bread, egg, onion, spices and herbs, wine, milk, or any of the combination thereof, sometimes with a filling, often encased in breadcrumbs. The croquette is usually shaped into a cylinder or disk, and then deep-fried." They are delicious: tasty, crunchy and perfect, and thanks to the above, it is nice to finally identify the ingredients in the soft mushy centre. After the serious business of shopping, I came away with a couple of novelty hats and flags, and an assortment of snacks. Apart from the gorgeous box (don't you love the trippiness of the nurse holding the box, which has the same picture of her holding the box etc etc. ); the cocoa is very good quality, rich and dark. Can't wait to get baking. Next to that is Rinse Appelstroop, or "Apple Spread". My Dad says that this is normally eaten on toast, not something that appeals to me, but I will find a use. 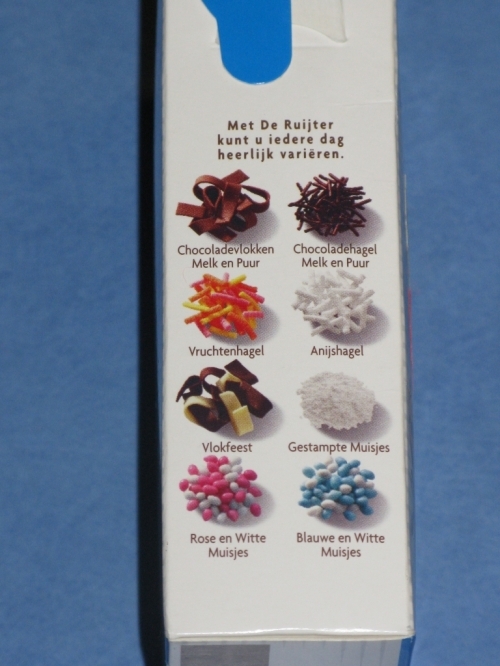 De Ruijter Chocoladehagel, milk chocolate sprinkles. These too are piled onto toast and eaten at breakfast. I guess if Tim Cahill is a Weet-Bix kid, the Dutch team must be running on pure sugar. You can see what strategy worked the best! Check out the other varieties too, the curls look kinda awesome to put on cupcakes. I think I'll eat mine with ice-cream. Speculaas are lovely cinnamon spiced biscuits. In this spread they are ground up, mixed with a caramel maybe and then eaten, yup you guessed it, on toast! And finally, Stroopwaffles, or Syrup waffles, or Stroopies in this case. There was also a whole pile of healthy things bought, but what's the fun in showing those? I did buy an awesome stick of rock candy in orange with the flag twirled through, but it was lost when we got home, probably for the best. So, armed with enough sugar to keep me awake though even the latest match, we head towards the Semi-Finals resplendent in orange.